Just off of South Chickasaw Street in downtown Pauls Valley, you can find literally thousands of wealthy crime-fighters, genetically altered madmen, and telekinetic space dwellers, all living under one roof. These aren’t living creatures, of course—supervillans and heroes would make terrible roommates; rather, they are part of the plastic menagerie of the Toy and Action Figure Museum (111 South Chickasaw Street in Pauls Valley. 405/238-6300 or actionfiguremuseum.com). Upon entering the museum, I was instantly transported to some lucky child’s youth. There are toys from the just a few years ago, the ’80s, and as far back as action figures go, which I can’t account for. And they are everywhere. Hanging from the rafters, in display cases on the walls, presented in life-like scenes, like the G.I. Joes fighting Nazis with Captain America’s help. I saw many familiar faces: Teenage Mutant Ninja Turtles, He-Man, My Little Pony (the only hard toy I was willing to cuddle with—I had about 225 of them). But I also learned a thing or two—at the Marvel and D.C. Comics Galleries, my fiance spent a long while teaching me how to tell the difference between the Green Arrow and the Green Lantern and other things I will probably never need to know but totally needed to know. 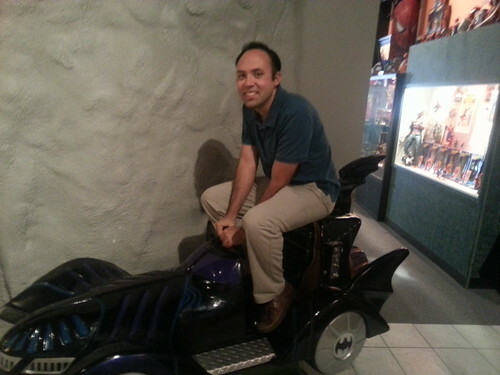 Phillip Ybarra borrows the caped crusader’s ride at the Toy and Action Figure Museum. 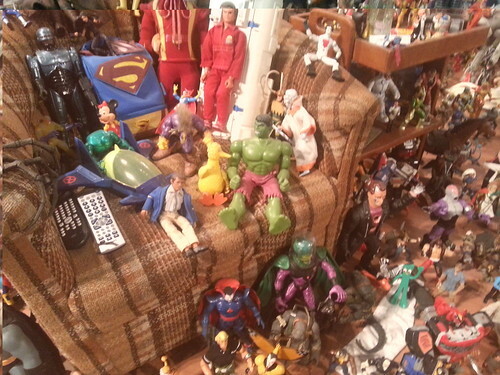 Finally, I witnessed a hostile takeover—or the aftermath of one, at least—of an adult toy collector’s room. Amid the chaos of the Adult Collector’s Diorama, the Hulk and Big Bird are found deep in conversation, possibly about the difficulty of matching outfits with green or yellow. Inscribed on the sign explaining the scene, museum cofounder, curator, and toy designer Kevin Stark, injected his own special kind of humor into the place. In the very distant future, I plan on having kids. Although I hope that they are never overrun by their own unruly collection of manufactured playmates, I can’t wait to bring them back to Pauls Valley to share this scene and the rest of the fun stories at the Toy and Action Figure Museum.